It was an electrifying final episode of the competition, kicking off with the final three contestants squaring off in two matchups ― Brand New team’s C Jamm versus Iron and then Bobby versus Iron in the final ― with the theme being money for the semifinals. In the last semifinal matchup, C Jamm hit the stage with an angry, raw performance, declaring that while other guys only care about how pretty their girlfriends are, he didn’t care about all that and that he was “the s―, b―.” He rounded it out by saying even black hip-hop artists would analyze his lyrics. He was followed by a more sober and dramatic performance from Iron, whose story of how growing up with no money had made him stronger had some of the audience members tearing up. In the end, Iron beat out the more established artist and said that he finally understood that by letting him do whatever he wanted on stage, his mentor YDG was actually training him to be a good hip-hop artist. Things heated up in the final round, with Bobby coming back in a very YG-inspired performance that had a melody that sounded oddly similar to Psy’s “Hangover” at points. He ended his moment in the spotlight by shouting in the direction of backstage, “Make a mistake, hyung!” when asked if he had any advice for Iron. Iron set the stage on fire in his performance ― literally. He opted for a rock-infused set, complete with flames shooting up around the DJ and on-stage drummer. It was a risky move, considering some fans’ negative reactions to previous rock-infused performances and his own reggae performance in the top eight, which some fans deemed “not real hip-hop.” It showed that no matter what, Iron would do what he wanted on stage, something he proved throughout the competition. The two stood side-by-side for the final announcement of the winner, saying they were grateful for the experience of being on the show. When asked who they thought would win, Bobby opted to stay silent while Iron said it would be close, but he was confident he would win. 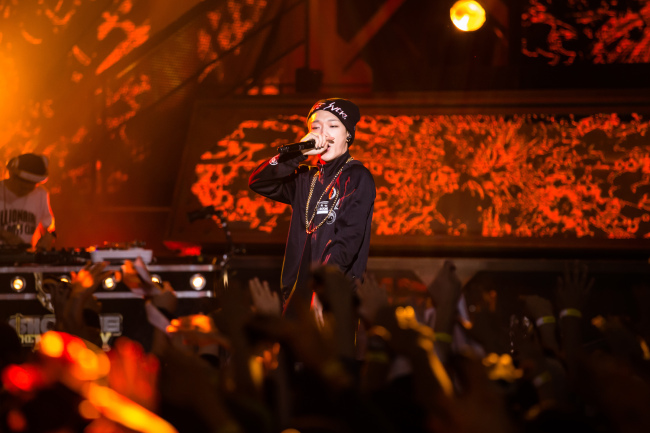 After an agonizingly long Q-and-A session with emcee Kim Jin-pyo, Bobby was announced the winner of the first round of voting, to the joy of most of the studio audience. In the end, he was named the final winner. Intern reporter Suh Ye-seul contributed to this article. ― Ed.